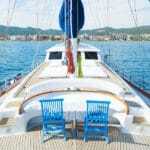 A blue cruise is a delightful luxury on board the gulet Dolce Vita. 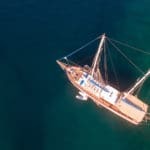 She is a true 36 meters classic Turkish gulet with only a single purpose; to offer total relaxation and comfort for her special guests during their gulet blue cruise holidays from Turkey. The Dolce Vita gullet may not be the ultimate in high class yachts; however she is one of those rare Turkish gulets that does provide a splendid sailing experience in the Mediterranean and Aegean waters of Turkey, as well as the neighboring Greek Islands. Guests can choose from two spacious master cabins, two double cabins and two twin cabins – all fitted with air conditioning, plasma TVs and en suites. The Dolce Vita offers a very wide layout throughout and plenty of natural lighting for times where you choose to be inside to relax and enjoy the cruise. On board, guests can indulge in tasty dishes from the Turkish kitchen in the aft dining area or in the salon. After meal times, and while she is enroute to the next port of call, you can enjoy refreshing drinks in the forward seating area as you take the fresh sea air and relax with incredible panoramic views. 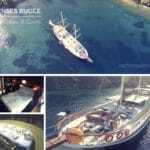 She is a great gulet boat for families as well as medium sized groups for blue cruise travel from Turkey. As itineraries are flexible, so are the activities you can choose to do in the water and on land. 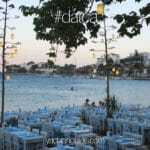 Gulet Dolce Vita and her warm and friendly crew of five are available all day long to pamper and serve your needs. There is no rush, no set schedule, just lounging about or being as active as you so choose to be on your holidays. Alternatively you can go on land to wherever the wind takes you and visit fantastic destinations filled with exploration and discovery. With reasonably priced weekly rates, why not let the charming and classic appeal of the Dolce Vita gulet, offer you a splendid Turkish gulet rentals holiday this season. There are many choices in island hopping gulet cruises from Turkey!